Is Odallus: The Dark Call a standout adventure, or just another game on the pile of new retro titles? We find out! While I’m generally not a fan of pigeon-holing games outside of things like genre and release platform, I think it’s safe to say we’re at a point now where if you’re making an intentionally ‘retro’-styled game, you can take one of a handful of approaches. You could make your game super referential, telling everyone how it’s “like x game, but in 8-bit!” while including tons of references, masquerading as jokes. You could make your game retro-styled, but with new twists and wrinkles in the gameplay and/or storytelling, thus appealing to the “old-school” crowd but bringing new-ish ideas to the fore (something like Braid or Fez). Or, if all you want to do is make a solid, fun game within the framework of other well-known titles without being too slavish to any one concept or genre, there’s plenty of room to work and make a respectable title using a combination of those methods. 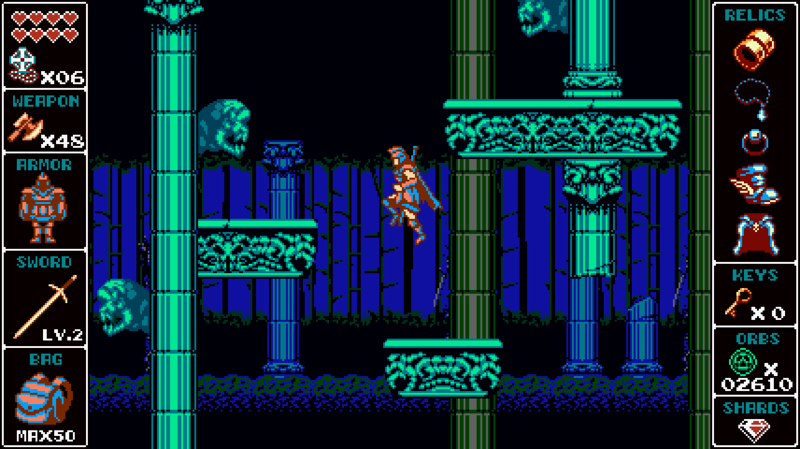 Odallus: The Dark Call falls squarely into that latter category and stands as a great example of making a retro-styled game without having to steal too obviously from 8-bit fan favorites. 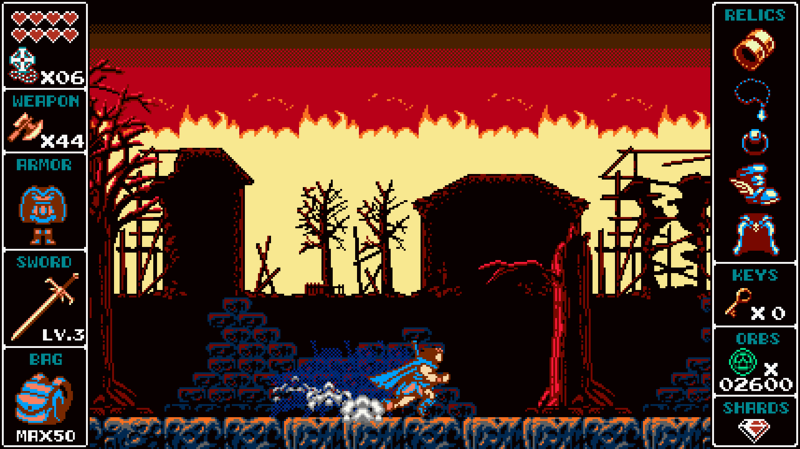 Odallus, from Brazilian studio JoyMasher (responsible for the underrated throwback action game Oniken), might look at first glance like a pretty well-made (and pretty) Castlevania homage/rip-off, what with its long-haired hero, bleak gothic-medieval setting, and familiar-looking subweapons. And on the surface you’d be right, but spend a little time playing and you’ll find there’s more to it – not much more, but more all the same. Gross skulls, precarious jumps, limited color palette – it’ll be just like elementary school again! You play as the awesomely named Haggis, a beefy Celtic warrior of some renown who finds himself longing for the day when he can hang up his sword and leave his life of bloodshed behind (all of which is conveyed to you in beautiful 8-bit, barely-animated cutscenes reminiscent of Ninja Gaiden, or even Shatterhand, almost). Upon finding your village burning and your son kidnapped, you set off to find out who took your child, why your clansmen are all turned into lunatic mutants raving about the death of your old gods, and where all these monsters are coming from. This quest will take you to many dismal and evocative locales throughout your kingdom as you try to reach the castle where your son is being held, and it is in this quest that the Castlevania references begin to crop up, but not the ones you’re expecting. Eschewing the ‘Metroidvania’ approach of ‘explore a large open world finding powers as you progress’ that games like Axiom Verge employ, Odallus recalls the more recent Castlevania: Order of Ecclesia, or maybe even Castlevania 3: Dracula’s Curse in the sense that it offers a world map to explore instead of one central location, but you have the ability to return to previously-completed levels to find new paths and secrets once you’ve found the items necessary for progression – say, a pair of bracers to let you move heavy objects or a torch to light up statues in the correct order. This almost Super Mario World approach allows players the chance to progress if they’re not too hung up on secrets while still encouraging exploration and experimentation, a concept that proves to be a big problem with a lot of latter-day Symphony of the Night clones. Let’s not jump to conclusions – the village may just be burning down because someone fell asleep without putting the fire out. God, what a boring game THAT would be. That sense of experimentation rings true in the combat, as well. While the beginning sword-slinging is simple and satisfying (even if the controls are occasionally unresponsive), the more weapons you collect the more options you feel like you have. The subweapons all have distinct feels and applications, and much of the moment-to-moment gameplay puts a focus on you juggling everything in your toolbox to match whatever situation is at hand. The fact that most puzzles can be solved by using weapons you already have as opposed to locating some mythical tchotchke really adds to the connection you feel with your arsenal, and between the options you have for combat and the fact Haggis feels much more limber than most 8-bit platform heroes (especially those stiff-kneed Belmont kids), the combat is generally the most thrilling part of Odallus, as it should be. It does feel a bit reductive to try and comment on a game’s graphics when it tries to look like a 1988 game in 2015, but I do want to draw some attention to Odallus‘ technical proficiencies. It looks damn good – almost too good, as the characters have a bit too much detail and animation for a NES game. Maybe we can pretend it’s an undiscovered classic from some obscure Japanese PC, likely made by Hudson or Sharp. I did encounter a few crashes, but nothing game-ruining, and the various window sizes I ran it in all loaded smoothly and barely took a toll on my computer, even with a few other resource-intensive programs running in the background. You might find yourself asking what exactly sets Odallus apart from other titles of the recent retro revival. Frankly, my answer is 'not much' – it still jocks on Castlevania and Ninja Gaiden like so many others, and while the gameplay is fun, it's nothing groundbreaking or relevatory. But it doesn't have to be. Odallus is a strong reminder that, when done well, you can mix and match different approaches from games that transpired before without having to reinvent the wheel every time, and still come up with something fun and playable. If you like solid, well-made action games of a certain era, and don't mind the occasional struggle with difficult (but fair) design, Odallus will provide welcome respite from a gaming landscape obsessed with high resolution and aimless open world design.